Sweet potatoes are one of my absolute favorite foods. What is funny is that when I was growing up I never liked them. Now I eat them whenever I get the chance. The sweet potatoes are baked until they are tender and sweet. Then they are filled with savory lentils and kale. 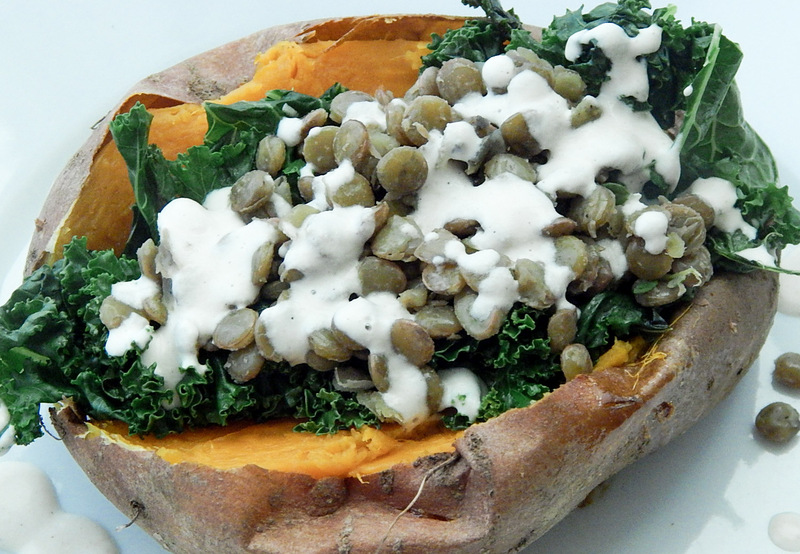 I topped it all with a creamy cashew tahini sauce that has garlic and lemon. I love how colorful and nutritious these potatoes are. There are a few steps to get this recipe together, but they are all easy. 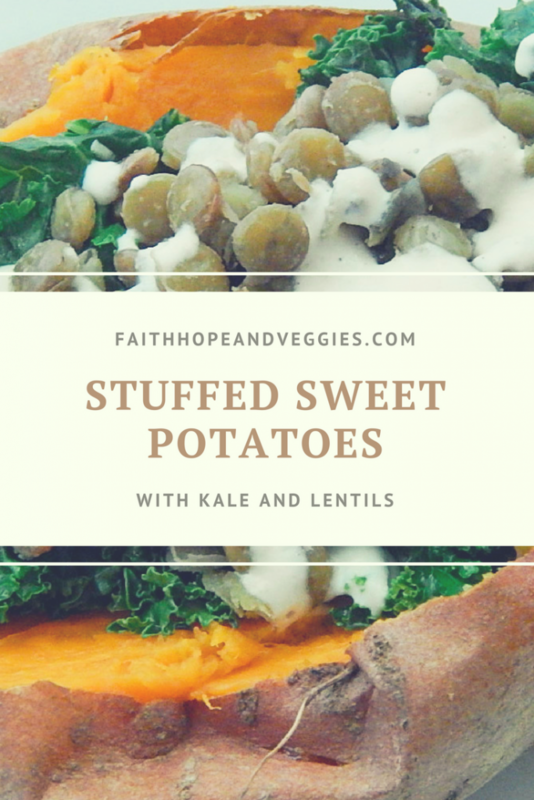 While the sweet potatoes are baking the rest of the meal can be put together. If I am making this for a weeknight meal I cook the sweet potatoes in the crockpot to save some time. It takes about 6 hours on low for them to cook. All of the other ingredients can also be prepped ahead, so they can be ready to go. Preheat the oven to 375. Fill a small bowl with water and soak the cashews. Scrub the sweet potatoes and poke a few small holes in them. Place them on a baking sheet and bake them for about 45 minutes until they are tender. While the potatoes are baking prep the rest of the meal: Rinse the lentils. Fill a medium pot with water and bring it to a boil. Boil the lentils for 20-25 minutes until they are soft. While the lentils are boiling dice the onion and saute it in 1 tbsp of olive oil for about 5 minutes. Once the onion is soft add in the thyme, sprinkle with a little salt and saute for another minute. Set aside until the lentils are cooked. Once the lentils are cooked drain them and add them into the onions and thyme. Prepare the Kale: Wash the kale and pat it dry. Remove the leaves from the stems and tear them into small pieces. In a large pan heat 2 tbsp of olive oil. Saute the kale until it begins to wilt. Add in the minced garlic and sprinkle with salt. Saute it for another minute and remove from the heat. For the sauce: Add all of the ingredients for the sauce into a high speed blender and blend until smooth. Once the potatoes are finished slice them down the middle to open them up. 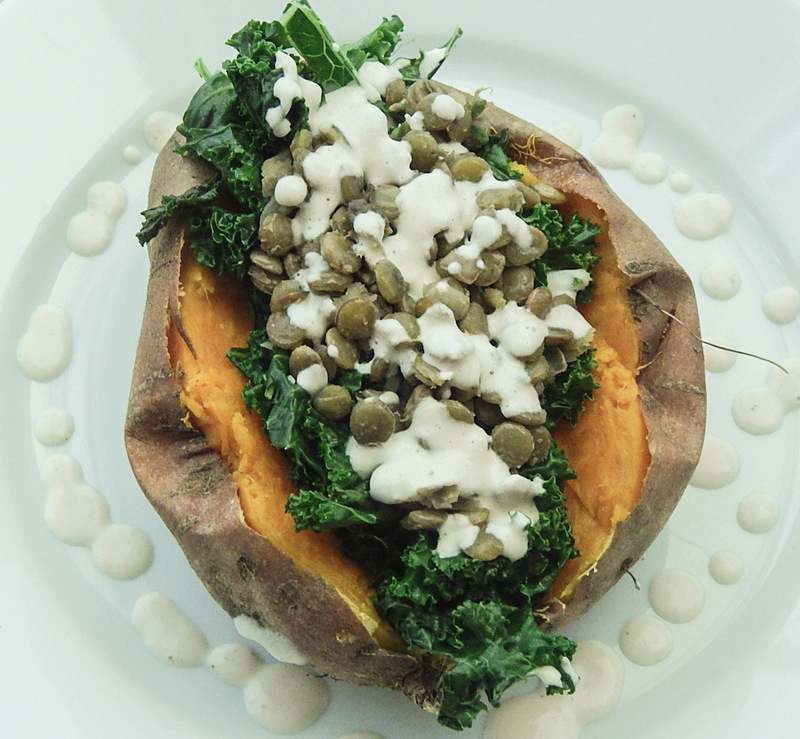 Fill each potato with some kale, lentils and top them the sauce.